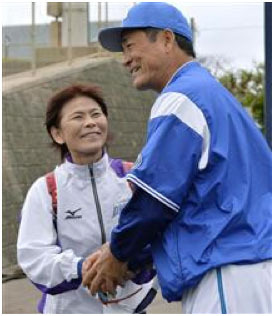 Ginowan, Okinawa Japan: Ms. Taeko Utsugi,(60) Vice President of International Softball Federation, visited spring training camp of Yokohama DeNA Baystars of Nippon Professional League in Ginowan, Okinawa to renew acquaintance with popular manager Kiyoshi Nakahata and solicit his support of reinstate both sports in Olympics. Both Utsugi and Nakahata were managers of Softball and Baseball for the Japanese National Teams in 2004 Athens Olympics and won bronze medal each. Manager Nakahata pledged to cooperate with Softball to generate nation-wide support to bring both sports back to Olympics in Tokyo in 2020.